On Saturday, my coworker S and I did a program for middle schoolers. We played life-sized Clue! It was an idea I got from the ILA conference last fall when they had a showcase for the state summer reading theme: Get in the Game - Read! When I found out that my library's programming theme for the spring was "Get Out and Play! ", I immediately wanted to do this game at my library. We had a pretty good turnout (despite the fact that the weather was gorgeous for the first time since October or so) and I think all the kids that came had a good time. This is a great program to put on, especially if you have teen volunteers who will help you with setup. 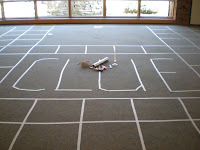 We laid out the game board on the floor with masking tape. It was definitely labor intensive, but if you had a couple of young volunteers, it wouldn't take them too long. It t ook us a solid hour to get the board set up, but I was happy with it when we was done. I made a sketch of how I wanted to set up the board before I started putting down tape. I based it on the game board, but I made many fewer squares between the rooms. We have a pretty large meeting room, so I made the squares 2' by 2'. That was plenty of room, but you could also have 1' by 1' squares if you have a smaller space. 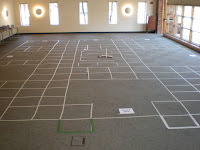 We included all the rooms from the original game and the players' starting points were designated with colored electrical tape (red for Miss Scarlet, blue for Mrs. Peacock, etc.). For the doors into the rooms, we simply wrote "DOOR" on that strip of masking tape. Of course, we had props. Most of this stuff can be found at your local dollar store. S brought the rope and a wrench from home. The "lead pipe" is a cardboard tube covered with aluminum foil (a paper towel tube would work perfectly for this). 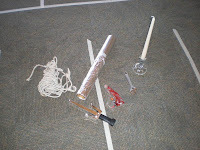 We used a water gun as a revolver, a plastic play knife, and a candlestick (all procured at the dollar store, although if you asked around it's quite possible your coworkers might have these items). 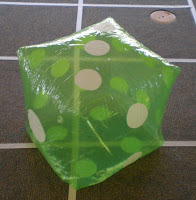 And, of course, the piece de resistance... the giant die. They come in different sizes for different prices and many online novelty stores carry them. The one I bought is 17" by 17" and I got it at Kopes Great Gifts and Gadgets. The shipping was a little expensive, but they were very prompt and I was happy with the product. It's hard to blow up, but the kids got a kick out of "rolling" it and I really think it was my favorite part of the game. We let the kids choose their characters and they could play alone or in teams. We ended up having two teams of three (Mrs. White and Mrs. Peacock) and three kids playing a character alone. Both ways worked fine, so you could do this game for as few as two kids or as many as 30-40 (although the game board would be quite crowded with 30 kids on it... I would suggest designating one person per team as the on-the-board player and having the rest hold cards, roll the dice, and keep track of their guesses). After the kids chose characters we went over the rules. I think everyone had played before, but sometimes people have slightly different rules, so it's good to be on the same page. Another note: if you're running the program with a coworker, make sure you figure out exactly what rules you're following before you start! It took us a little over an hour to run one game (counting the time spent choosing characters and explaining the rules at the beginning). It was the perfect amount of time because by the end of that hour, everyone was tired of standing up. A few of the kids stayed to help me take the tape up when we were done (which is a lot easier than putting it down! ).